Spring is here and so is beginning of the Little League baseball season, weather permitting! You’ll be making plenty of trips to the ballpark for practice and games, and often becoming just as much of a coach for your child as you are a proud parent and fan. Because most youth throwing injuries occur while pitching, I wanted to throw out a few tips and bring to your attention some of the factors that may reduce injury risk for youth pitchers. Whether in practices or games, seek to create an effective learning environment with young players. There are various styles of learning. The three primary modes are visual, auditory, and kinesthetic and an efficient teaching plan includes all three modalities. Don’t neglect the basic movement patterns that are involved in pitching and baseball in general. All too often emphasis is placed on getting players’ arms in shape, but no attention is paid to preparing the rest of their bodies for the sport. Baseball pitching requires fundamental movements such as stepping, lunging, squatting, twisting, and balancing. Most kids are getting enough of these movements just playing at school, but if you feel your child needs more exercise to prepare for the baseball season, get them active with these fundamental movements. Make sure to engage in a full body warm-up, not just the throwing arm, before throwing or pitching. A full body warm-up elevates core body temperature, enhances motor unit excitability, helps maximize active Range of Motion (ROM) and is effective for reducing injuries in all sports. Basically, make them break a sweat before throwing! Pitch volume is a significant factor in the injury of youth pitchers. All Little Leagues appropriately have pitch count rules in place, but pitch volume can be defined as the number of pitches thrown in a season, not just games. This should include games, pre-game warm-up, scheduled practices as well as unorganized practices with friends and even Mom and Dad! Several studies have confirmed that there was a 35% increase in elbow pain in athletes aged 9-12 years old who are throwing greater than 75 pitches a game and 600 pitches in a season. I have not come across studies that attempt to count the number of pitches thrown outside of games and organized practices throughout a full year of baseball competition. Keeping tabs on your child’s pitch volume and encouraging him/her to communicate feeling fatigue and/or pain will help reduce overuse injuries. Another main contributor to injury is the pitch type. 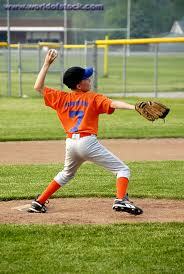 Several studies have recommended youth baseball pitchers not to throw breaking pitches (curveball and slider). This recommendation is based on the fact that throwing breaking pitches requires increased forearm supination and wrist movement when compared with the fastball. The difference in hand, wrist and forearm positioning may lead to greater elbow stress and potential injury. Overall, I recommended that youth baseball pitchers focus on the basic fundamental movements and the mechanics of pitching (balance point, stride, throwing elbow height, follow through). After mastery of these fundamentals, focus on fastball pitching mechanics followed by change-up pitching mechanics. Both pitches should be executed with accuracy before introducing curveballs or sliders. Resistance training may reduce the risk of injury in youth sports by changing the size, density and mechanical properties of connective tissue structures. (Marsh, 2010) Other benefits of resistance training include recruitment and activation of muscles and enhanced coordination. Strengthening muscles and connective tissues also allows for increased forces that athletes are capable of sustaining, reducing the risk of injury. The muscles of the trunk are particularly important in pitching. The trunk is where the force generated by the legs is transferred to the throwing arm and ball to maximize pitching efficiency and velocity. Remember Little Leaguers are just kids. They need to learn how to play the game and how to interact and work with teammates. Above all, keep them safe and encourage them to have fun.